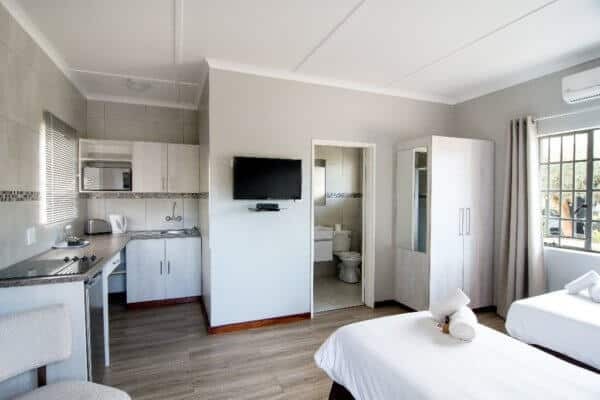 Arebbusch Travel Lodge is running a special on their double, twin, triple and large self-catering chalets from now until the end of June 2018. Kids Rates: If sharing with an adult – kids pay 50% of the difference between the adult rates. Braai / BBQ, TV with selected DSTV Channels, Crockery & Cutlery, Toaster, Kettle, Fridge, Stove, Safe, Telephone, Wi-Fi, Air-Conditioner, Coffee & Tea Station, Restaurant On-Site with Room Service, Bedding & Linen, Serviced Daily, Parking Adjacent To Room, Safe Family Friendly Environment, Kiddies Play Area, Natural Garden Setting & Wide Variety of Birdlife. Rates include VAT & the NTB Levy. These rates are only available if you book directly with Arebbusch via telephone, email or our website. Plus – If you book directly via the Arebbusch website and you use the promo code: “direct” when making your booking, you will receive an additional 10% off the displayed rates.